Today prefinished hardwood flooring is beautiful, durable, and a great investment for any home. 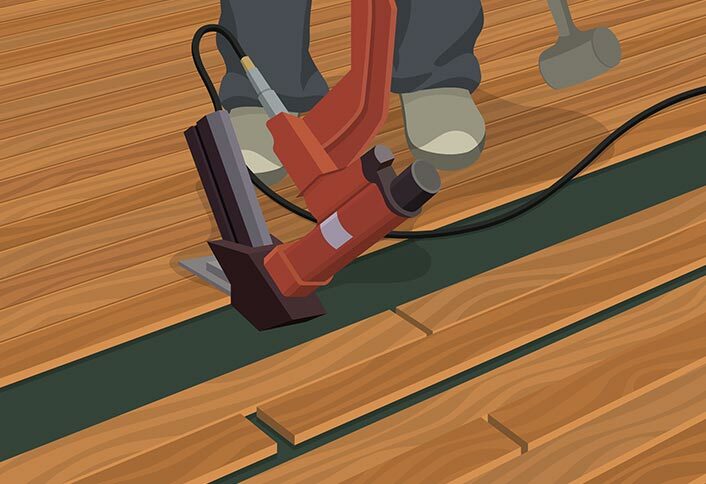 These installation instructions go over the essential things you’ll need to know during your prefinished hardwood installation. Glue Down – For solid hardwood above wood or concrete subfloors. Nail/Staple – For solid and engineered hardwood above wood subfloors or above concrete subfloors overlaid with a plywood underlayment. Click Lock Floating – For engineered click lock flooring above wood or concrete subfloors. Engineered Floating – For engineered hardwood above wood or concrete subfloors. You will need most of the general tools and materials plus anything specific for your installation method.